1.3 How to Apply For TS ECET 2019? Jawaharlal Nehru Technological University, Hyderabad is conducting Telangana ECET Exam 2019. On behalf of the Telangana State Council of Higher Education (TSCHE), ECET, i.e., Engineering Common Entrance Test is conducted by JNTUH. The TS ECET is a state-level entrance examination for Lateral Entry for Engineering. Interested and eligible candidates can Apply Online for TS ECET 2019. Therefore, the Students who are waiting for the TS ECET Exam must submit the Telangana ECET Application 2019 on or before the last date. The students who are interested to get the admission in B.tech/B.E can check the steps to fill TS ECET Online Application Form 2019 in the following sections of the page. To appear the Telangana ECET examination, first you have to apply online. For TS ECET Online Application form you have to visit the official site which is provided below. Here you can find a step by step process about how to fill the Telangana ECET online application form of TS ECET. TS Engineering Common Entrance Test is an entry-level examination for diploma holders Engineering/ Technology/ Pharmacy and B.Sc degree holders. Students can seek lateral admission into 2nd-year regular B.E/B.TECH/B.Pharm in various colleges, institutions, universities through Telangana ECET examination. So, read the instructions carefully before applying for the TS ECET 2019. Aspirants can pay the application fee through TS online or Credit/Debit/ Net banking. The TS ECET is an entry-level examination conducted by JNTUH. Through TS ECET Notification students can have a lateral entry for II year B.E/B.Tech. Aspirants have to check eligibility criteria before applying for the ECET exam 2019. Applicants who want to appear for the TS ECET Exam 2019 should be qualified for their Diploma in Pharmacy/ Engineering Technology/ B.Sc with an aggregate of 45% marks. The important dates regarding the TS ECET are provided below. The notifications regarding the TS ECET exam are sent to your registered mobile number so always maintain the number active. Level of Exam State Level Exam. Last Date 8th April 2019. Date of Exam 11th May 2019. How to Apply For TS ECET 2019? Filling TS ECET Online application. Fill Telangana ECET Application Form. Printing Telangana ECET Registration Form. Don’t you have no idea about the Telangana ECET Application Process? Then get it now immediately. For that candidates need not to search for more websites. We have provided the detailed TS ECET Online Application Process for your convenience. Those candidates who are applying for the Telangana ECET 2019 must refer the application process to avoid mistakes in application filling. 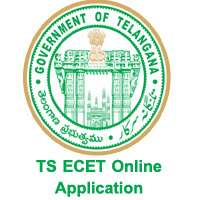 Initially, log in to the TS ECET official website, i.e., ecet.tsche.ac.in. Aspirants have to fill all the required particulars in the application form. Therefore, maintain all the relevant documents which are helpful to fill the particulars in the application form. Upload a recent photograph with signature. By “Apply Online” button we can apply for the TS ECET. To submit the application form candidates have to make payment. Payment can be made either through TS online or Credit/Debit/Net Banking. Aspirants have to visit their nearest TS online Centres like Mee-Seva or E-Seva centres. To make a payment, you have to provide all the details like Name, DOB, Mobile Number, etc. Transaction ID with a receipt of the fee is given after the payment. By clicking the “online payment” button, we can pay the application fee to proceed with the other steps in the application form. After completing the banking process, you will receive a Journal Number. Log in to the Official Website using Login ID and Password. Fill the Telangana ECET Application form and submit. Finally, for future reference take a print-out of the submitted application form which is helpful for the counselling process or future purposes. For appearing and submitting the TS ECET online application form candidates have to pay the application fee. Application Fee for SC ST Candidates – Rs.400/-. Application Fee for Others – Rs.800/-. Submission of TSECET 2019 Online Application Form 6th March 2019. Last Date for Submission of Online Application 8th April 2019. TS ECET 2019 Application Form Submission with Rs.500/- Fine 15th April 2019. Last Date to submit the TS ECET Online Application with a fine of Rs. 1000/- 22nd April 2019. TS ICEt 2019 Online Application Submission last date with Rs.5000/- fine 29th April 2019. Final date for TS ECET Apply Online with Late fee of Rs.10000/- 6th May 2019. Telangana ECET Exam Date 11th May 2019. Start your exam preparation by downloading the ECET Syllabus & Telangana ECET Previous Years Question Papers. Apply online for the ECET Exam as early as possible and begin your preparation. Therefore, download the ECET Exam Syllabus, test structure and previous years question papers. How can I re correction? I had paid the amount 802 rupees but I didn’t get my login id and password yet what I should do know? I am also same i paid 802rs but I didnot get my I’d and password sir please tell me what can I do?? is gazetted sign should be attested by our college principal or anyone who is capable of it??? Amount was deducted from the account but the did not get the login details hence did another payment and got the login details. How can get the first payment amount back? B tech, M tech, B parmacy, M parmacy, MBA, MCA etc…. Hello sir I made a mistake in caste how do i change that? Sir I had mistake my pin how to remove curection ples tell me? can i change the option. The Information provided here is only for Reference purpose. Visit the AP ECET Official Website i.e., www.sche.ap.gov.in/ecet and TS ECET Official Website i.e., ecet.tsche.ac.in for complete details.